Her funeral was Sunday. Ironic, I thought. It’s October. National Breast Cancer Awareness Month. The very evil that stole her years. Sixty-three years young. A 40-year veteran nurse. A wife. Mother of four. Grandmother of two. My friend. For close to ten years, we wrestled through tough parenting seasons together. Sat through chemo appointments together. Talked about death and life together. But Sunday I said “goodbye.” For now. The fear is real. I may put on a brave face, talk strong about “fighting” and “living.” And I mean it, every word. But don’t let my determination to survive fool you into believing I don’t have sleepless nights. The fear chokes. Not every moment, and not every day. But it’s a real struggle, one that can paralyze. When it does, I can’t eat, can’t focus, can’t remember the peace of the day before because of the plague of today’s “what-ifs.” Be assured, I’m fighting it. I’m clinging to my faith and the love of a God that will not fail. Even so. The sting of death is real and it is powerful. Otherwise you and I wouldn’t need a Savior who came to conquer it. Please, don’t take it personal. When I don’t reply to your text. When I don’t return your phone call. When I don’t remember your birthday or favorite color or that date we scheduled weeks ago but I failed to keep. Please. It has nothing to do with you, and everything to do with this elephant that has taken up residence in my life. I aim to shrink it down to size, to regain a healthy perspective. But it’s a work in progress. Please know I’m not mad or offended. I’m simply overwhelmed. Treatment may be done, but the real battle has just begun. I am more than a disease. As I’m struggling to see beyond the elephant, I’m asking you to see beyond it, too. The truth is I need your help. Please ask me how I’m doing, of course. Ignoring the reality of doctor’s appointments and scans and unknowns won’t change any of it. But help me by refusing to allow cancer to become the sum-total of our conversations. I need to know you see more in me than a disease. So let’s watch a comedy and laugh until our sides hurt. Let’s talk about our kids, our husbands, our jobs, our dreams. Maybe we could take a walk, go to a ballgame, discuss a book. You know—all the things we did and discussed before cancer. By the way, if I say “no” or “not today,” please don’t stop asking. I need to know cancer won’t rob me of you, too. When cancer takes someone I love, I feel it to my bones. Death feels different now. Heavier. Holy, even. Now that I know it could happen to me. Now that I’ve had a sampling of the suffering one faces in the final days of a dwindling life. I know. How I wish I didn’t! As much as I want to go back to my pre-cancer ignorance, I can’t un-know the truth. That means when our mutual friend dies of cancer, we both weep and grieve. But I feel it differently, in a way that makes me hurt, down to my bones. It could be me in that casket, and I know it. Grace and goodbyes matter. It may sound like a small thing, a silly thing. But I don’t want to leave anything unsaid. I can’t. A “next time” may never come. That’s why “I love you” and “goodbye” are necessary each time we’re together. Disagreements will still come, I know this. Cancer doesn’t make me or you any less human. But do me a favor, okay? Don’t walk away mad. Don’t ignore me or disregard me or let today’s frustration poison tomorrow’s relationship. Instead, let’s settle matters quickly and live in a deep ocean of grace. It matters more than you know. I’m not the same person I was before. Time heals, yes. But time doesn’t erase the scars. The doctors say five years is the magic mark. If I make it cancer-free for five, I’m home free. But I know better. All of us who’ve been there know better. I may live to eighty, but I’ll carry the evidence of this season for the rest of my life. It’ll send shivers up my spine when I drive past the doctor’s office. It’ll upset my stomach when a twinge of pain convinces me “it’s back.” Cancer gives two unexpected gifts: (1) a haunting awareness of the fragility of life and (2) a weighty determination to enjoy it. That means I’ll dance again, no doubt. But I’ll always do it with a bit of a limp. 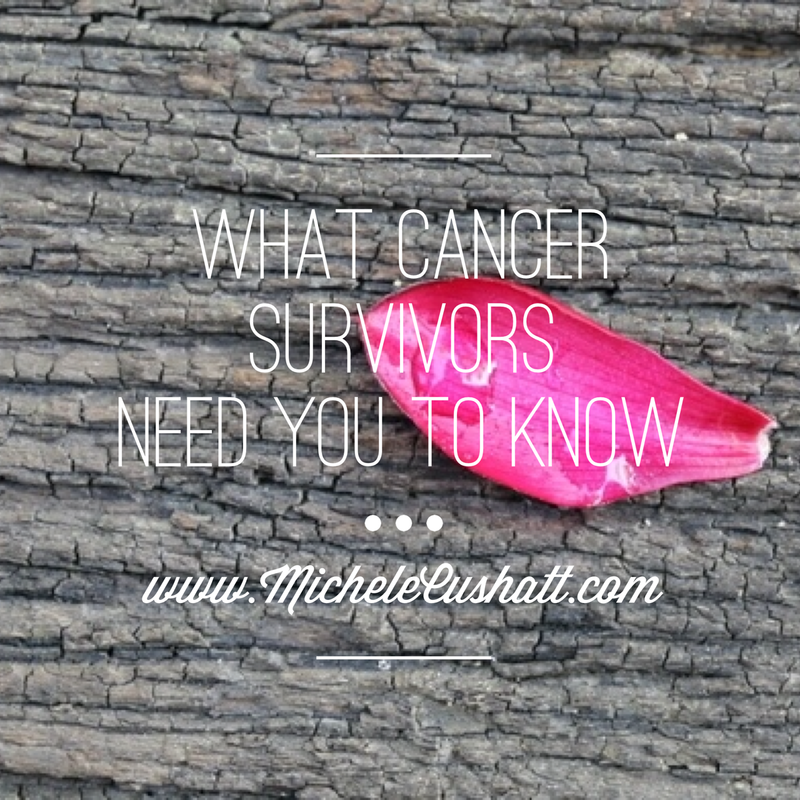 If you’re a cancer-survivor or have walked closely with someone who is, what insights would you add to this list? I think you have covered it all. Thank you ! I have been reading your blog now for several months, You are amazing!! You are precious and transparent and real. You teach me things I did not know. Your writing makes me want to grab a pen and try harder. Your passion is contagious and your calling is unlimited. “But I’ll always do it with a bit of a limp.” This morning, in my First 5 Bible Study app (fabulous), we read about Jacob, and his wrestling match with the angel. His hip ended up permanently dislocated. Krista Williams, who wrote today’s lesson said, “Jacob’s strength was in his limp (I thought of you and me immediately!). It was a constant reminder God was in charge.” Sometimes pride gets in the way of telling people what I need. You inspire me…every day! I am a 3.5 yr kidney cancer survivor. Cancer changes you. It just does. Little things don’t really matter anymore. You gain a new perspective on loved ones. Maybe even attempting to reconcile an old hurt with a former friend. The same year I got my cancer diagnosis, I lost my 36 yr old cousin to lung cancer, in a woman who never smoked! I sat there at her funeral, literally shaking. I’d said to some of my other cousins that this could be MY funeral you’re attending today. Our sons were born a week apart in 2004. We spent a lot of time together growing up. Why her and not me? I’m sure I’m not the only one who thought that. It’s just not fair, this life. I have to stand firm in God, that He knows the why’s & what for’s. That’s what gets me through every day. Thank you, Michele. October is tough for me as well each year as October 12 rears its head—the day my grandmother died of brain cancer. It’s been 26 years and I still remember her well. Your words are welcome to me. It’s been 17 years since my breast cancer season started. It changed my life completely. I still have the feelings that you describe. I still have short term memory lose..I am looking for a large book of art paper and I have no recall of where I put it. But I see more birds. I am more aware of what’s important. Jesus had always been close but after C our relationship changed. It was not “can You help me with this”. It was “what do.You want me to do for You, Jesus. The song One Day at a Time fits. Love to you. I am sorry about your friend. This is so beautiful – for the survivors who have beat cancer, and for the survivors for the family members left behind when someone passes away. I’d add that grief (both for a diagnosis, treatment and/or loss) does not have a timetable. I’ve taken to just not talking about it any longer, how I miss my Dad. How those months at the chemo center and weeks in ICU changed us. Why? Because grief a week or a month or even a year down the road seems acceptable. But what about two years. Three. Four. Ten? The grief seems played then. It’s another kind of elephant when we sit down to coffee with a friend. I know Christ is with us. (He IS faithful!) And I know we can move on. But the “missing”… it never goes away. It will not be gone until I reach heaven and Jesus wipes away that heart’s tear. For the families affected — cancer has forever changed us. Our holidays, graduations, weddings, triumphs and trials will never be the same without our loved one to share in them. Those moments will still harbor Jesus-given JOY (Praise Him for that! ), but the missing will accompany our hearts every single day. Grief has no timetable. You’re absolutely right. The grief does not follow a timeline. And yet, after a year, I feel like I’ve already worn everyone out with my sadness. So I keep it to myself. The missing never goes away, I understand that now, too. So we wait, eyes to heaven, and hold out hope for what is yet to come. Much love to you, Kristy. Grief knows no timetable. I lost my father (COPD, not cancer) 45 years ago, when I was 9. Some days (not real often, but a few times a year), the grief overwhelms me. Lost my mother to cancer in 1989 when I was only 28 — same thing. Lost both my siblings (one to cancer, one to complications of COPD — which I also have), also — within the past 7 years. I grieve a little every day. But I also rejoice that some day, when it is my time, I will be reunited with them. I also live very much in the present and have welcomed my first grandchild into my life this fall — yes, it was a little bittersweet, knowing that my parents and siblings did not live long enough to see my son married or me become a grandparent. So, the grief starts again. But then I smile, because I know they are watching, so really have not missed these things in my life. Bless all of you who are fighting disease, and in different stages of grieving. And yes, it’s ok to grieve — even 45 years down the road! Girl- you know this post is so close to home for me. Thank you again for writing this. What I would like to say to caregivers is this: Don’t be afraid to show your fear and cry with your loved one. We think we have to be brave the entire time, not true. They are human and need to cry and vent and scream or whatever they need to do and sometimes we need to do it with them. Because the truth of the matter is, we are walking the cancer journey with them and we want to scream at the madness of it all as well. And the other I would say to caregivers: be kind to yourself. There is no rule book for this thing. Be proud of yourself, you are doing a great job. Prayers for everyone fighting this disease and their families as well. I write about rooted hope using my story of loss as known to me in many ways, currently as an Alzheimer’s caregiver. I use gardening as a gateway to discuss not just a benign hope, but a rooted one. Your post here translates into my very long journey of being Mom’s primary will. I too can’t unknow the truth of what this long walk of Alzheimer’s is like. It’s such an evil robber. And God weaves so much beauty in spite of that fact. Everyday, I want bigger eyes to see Him. My mom lived with us through her 7 year battle with Ovarian cancer and I saw so much of what you wrote in her fight as well. Then as a mom of a son who has a long term illness , with a 100% fatal diagnosis I have struggle with MANY of these same thoughts and feelings. You could just as easily wrote the title of this blog ” What parents of a child with a long term illness should know”, it wouldn’t take much more than changing a few words . Just the other night I was praying for a friend of mine who has a child struggling as well with a physical long term illness. I could feel so much of her pain, I never knew how much it could hurt , until my sons diagnosis. God has used both my moms cancer and my sons illness to change who I am. I see these people who are struggling and I can relate and am drawn to them. It is not easy, it hurts and I am sad to say, in the past I probably wouldn’t have said much then I am praying for you. And now, as you stated, I feel it to my bones as well. We seek to find joy in each day, little things mean so much more when you are facing and unknown future. I am thankful for how God is changing me, but feel like i drag my feet all the way, its hard, it hurts, unfortunately a lot of times in involves those we love as well. All that you have said is true, the fear of reoccurance is real and will not be ignored, but the need and desire to live fully in the moment is also real and should not be ignored. I’m now to the point I don’t want to spend my time on the fake things of life, I also want to embrace those who cross my path, the people who I come in contact with are what matters to me. I’m five years past treatment but because of the stage of colon cancer when diagnosed I will not be able to step away, but I know no one who lives with a diagnosis of cancer gets to truly step away. The cancer was an honest enemy, chemo-not so honest-it has taken so much. Chemo was framed in the light of fighting the disease, it did, but it also destroyed. Yes I grieve for past days when I was a whole person, but I also look forward to the day when I will be made whole again. I’m living well, but I will always be gimpy! You choked up this 6′ 4″ 40 year old man. I lost my sweet mom last June to cancer. Although she was assured of her future home, she fought valiantly to survive. Although I learned much from her in the years before her sickness, it was during her battle that she was the greatest teacher. From watching her I learned what it meant to have real courage and deep faith. I watched her live out her favorite scripture, “All things work for good…” with 100% conviction. And I learned to apply perspective to my insignificant problems. I really wish that she was still here to enjoy life, but the life I live now is much richer for the lessons I learned through her example in the last two years of her life. I know that if you had your preference, you would have not picked cancer as your teaching platform. But please know this…God is using you in this struggle. These words you wrote? BEAUTIFUL. Your mama woud be so proud. Thank you, my friend. My dad was diagnosed with stage IV bladder cancer when I was in the process of obtaining permanent residence in the US, ten years ago. I was not allowed to leave the country and go home to my native Mexico, so I walked the first months after diagnosis at a distance. Phone calls and emails was the best we could do. I so wanted to be by my parents’ side. When my immigration documents were approved, I spent a month with them, catching up. He underwent chemo, radiation and radical surgery to remove the bladder. None of it worked. He was 59 years old. I was pregnant with my first child when I hugged him for the last time. He didn’t get to know my children. 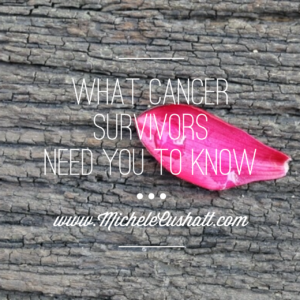 As a family member of a cancer patient, I agree with your insight Michele. We want life to be “normal”. Please don’t say “My (X) died from it too. Or… it was because he/she was a smoker/drinker/had bad health habits…” Please don’t say “God needed another angel”. Please don’t say “I know how you feel”. The illness and the loss are devastating, yet we all experience them different. I feel pain for those who have lost the battle and I rejoice with survivors and fighters. This disease takes over lives and rips families apart. All we can do is hold each other and walk together. As I prepare to attend Women of Faith this weekend, Michele, I am THANKFUL that you’re with us and that we get to praise God for his healing power and the work He is doing in all of us through your story. Thank you. October is a hard month. Everything you said is true and most beautiful. Tank ou for sharing these words with us. Thank you so much for this. I am a different kind of “cancer survivor”. When someone “beats cancer”, we are encouraged that it can happen and somehow brings hope. Michele, when someone like you is willing to share your story and how you really feel, you bring hope to many of us in so many areas of life. My daughter and I and the rest of our family are “cancer survivors”. We lost my first husband when he and I were 33 years old. I had no idea how in the world I was going to live without the love of my life and a wonderful father to my young girls. I love hearing that someone else is receiving healing or “beating the odds”, it doesn’t cause any regret or anger at God for me. No, it brings hope that no matter what we are facing, our joy in Christ is not based on our circumstances. Your list is fantastic Michele. You are asking what we would add. I would add something about my faith in God is real. When you don’t know what to say, please just tell me that rather than trying to fix my faith. There really aren’t any quick and easy answers. I realize that you don’t have any answers for my pain. Just be with me, your presence means more than I can begin to share. For me it is this: Don’t expect me to return to “normal” or do everything I did before or do it as well. I have a new normal; slower, more deliberate. “Important” has a new definition to me and does not coincide with everyone else’s. Wow! Your words are the same as my thoughts! I am a breast cancer survivor…almost 2 years. This was so timely as I had a dexa-scan and mammogram today. These doctor visits, check-ups, and especially the mammograms, are truly a form of PTSD – pointed out to me by my wonderful surgeon. I know 2 years in is not a lot, but I keep hoping the fear won’t come. That I can reach the place where I don’t think about it or worry about it coming back. Whenever I have an appointment looming, though all the check-ups have been great so far, I keep waiting for the other shoe to drop. It’s tough to be upbeat and positive, and at the same time scared. Thank you for all the sharing you have done on your journey. It helps more than you know! I’m so glad it encourages you, Debbie. Helps to know we’re not alone! Thank you for helping me be a better friend. We love you. And I love you. You’re a GOOD friend, KD. Forever grateful. I’m a two time breast cancer survivor. Five years to the day after ending treatment for the first cancer (lumpectomy/radiation), I was diagnosed with a very rare secondary breast cancer (angiosarcoma) that developed as a result of the radiation I had five years ago. This time, however, treatment was much more brutal — mastectomy (outer skin and all) and major breast reconstruction from abdominal tissue (TRAM Flap surgery). I’ve had three surgeries since March and one more to go to complete my reconstruction. Recovery has been very challenging, very slow, and has required a lot of help from family and friends. I’m uncomfortable 100% of the time (some of this should ease up as time goes by), which is a constant reminder of what I had and what can come back. It’s impossible to get it out of my head. And as was stated in the article, losing a friend or acquaintance to cancer is devastating; it consumes me with equal parts fear and survivor guilt. That’s been a real stressful thing to deal with. But my faith is strong, and I’ve learned to deal with what I can’t control, although sometimes it’s easier said than done. Thank you for expressing your thoughts. We share membership in a rather dubious fraternity, but I so appreciate the support from those who have walked this path. I would add nothing. I am 4 yrs out… 1 year from the “promised land” and I felt every sentence you wrote and I type this with tears rolling down my face. It sometimes feels like no one understand the perspective cancer gives. The shift it brings to your psyche. Songs change meaning. Friendships change, evolve, deepen, and some disappear. I am so sad for so many and so grateful for my life. Terry, so sorry to hear that you have Cancer. My daughter is battling the same disease. She has just had both breast removed and has started Chemo and next part of treatment will be Radiation. She is only 32 years old with two children 9 and 3 as well as a husband. My comment would be that maybe we can’t exactly understand what each person with Cancer is going through but I want to add that remember family and friends are suffering as well. I would carry this decease of Cancer for my daughter if I could and I am sure there would be people that would carry yours for you as well, if that were possible. My point is this, “the stress of watching the one that you love so dearly have to deal with Cancer is devastating to the people that are going thru this with you”. If we seem to walk away with a sad face for a period of time is isn’t that we love you less or that we are going to leave you or that our feelings have been hurt. It is that we fear as you do “the person with the disease”, could leave us as well. Fear takes over and feelings of helpless of not knowing what else can I do takes over. I have prayed that God will take this from my daughter and let me be the one with the Cancer. What I am trying to leave with this message is that is effects each of us “all of us” anyone connected with you. I hope that my comment can only add to educating each of us to bring together a better understanding of the feelings of everyone. I also pray that my comment will help all of us to put our fears and our pains aside and stick together knowing that we have a God that has never failed us and that he “God” is still in control of each of our lives. God knows what he is doing and if we can allow ourselves to trust him and his word we can live each day with less fear, hurt and pain knowing that our God is not taking any of us until he chooses. How beautifully written! I am blessed to be a survivo–for now–but my tomorrows are in Gods hands. Thank you for sharing words that could apply to anyone battling a life threatening disease. Alive today, trusting Him for tomorrow. Wherever I wake up. With you, Jan.
– Most likely, my cancer is not my fault. So please don’t ask me about my diet, my family history, or “how” I got this disease. I don’t know, and my doctors don’t know either. I’ve asked them, and all they can do is guess or shrug their shoulders. I’ve read every book and article and website about my cancer, and they don’t know either. Most of the time, why someone gets cancer is a mystery. – I don’t need suggestions on treatment options. I know you want to help with advice, stories, examples, or tips on holistic miracle treatments, but I’m working with a team of medical professionals who is up on the latest in treatment options and with their help, and my own research, I am making the best decisions I can make for my own personal situation. Your suggestions to avoid sugar, drink vinegar, or travel to Mexico for a miracle treatment won’t help. Just be my friend. Don’t try to fix me. And….for the love of God (and me), don’t tell me any cancer horror stories. When I was first diagnosed with breast cancer, a friend told me a horror story about her’s sister’s breast cancer surgery. Six years later, I’m still horrified. Please bite your lip when this impulse arises. One thousand times YES. Such good advice here, Susy. If I had a dollar for every “remedy” I’ve been offered, I could pay for my own cure. 😉 The other day I explained it to a friend this way: When someone tells me what I should do to “cure” the cancer, the implication is that I also did something to cause it. In other words, if I would’ve just avoided this or that, I wouldn’t be in this predicament. That’s a heavy load to put on someone trying to wade through a diagnosis. It’s only complicated by the fact that most people who offer said advice don’t have the trust relationship in place to do so. Thanks for being bold enough to bring this to our attention, Susy. Three cheers for you! I’ve heard about this relative to plane crash survivors, but can’t help but think this is a real “thing” for cancer survivors too. Today, as I read your post, I am 1 year past my first chemo treatment for Hodgkin’s Lymphoma, and am considered cured. Oh, but the guilt around fighting such a short fight, with only 2 months of chemo! I feel like people without a personal diagnosis can never really understand the guilt I feel around beating this thing! “Why on earth would you feel guilty?” they’d say, if I admitted my guilt. I feel awful talking with a cancer patient or family member about their suffering as I dread when they ask about my “journey” as my suffering always pales in comparison to theirs. So much guilt I can’t even articulate. But I don’t think anyone can really listen to me talk about feeling guilty without the inclination to try to talk me out of those feelings and convince me to just be grateful. I am SO grateful, yet can’t help but feeling guilty too. I weep and grieve deeply for people fighting for their lives, suffering the effects of surgeries, and living through the horrifying chemo (and radiation) side effects. I especially hurt when I know they’re not ultimately going to “win” their battle like I did. But I weep the hardest when I realize they don’t have the hope I had, and have, knowing we have an awesome God who loves us, and is with us every step of the way. That was my unfair advantage. HE is my “x” factor! Hope in Him. Sounds so simple, doesn’t it. There it is again. Hope. Let me be clear, I don’t wish cancer (or homelessness) on anyone. BUT, I do wish there was a way others could get even a glimpse of what God’s kingdom looks and feels like, as I did through my suffering. Thy kingdom CAME when I was homeless, and Thy kingdom CAME when I had cancer. I was so well cared for. People were kind, patient, encouraging, faithful, gentle, prayerful and generous. People fed my family, clothed my children, offered to clean my house, spent time with me. They listened to me, they walked with me, they took care of me, and made sure my needs were met. They loved me. Sound familiar? It is straight out of the Bible! That was God’s kingdom in the flesh, and I had a front row seat! WOW! What a privilege! And it’s not that I don’t feel loved or cared for these days, but it’s just not the same. There is no urgency. After all, no one’s dying around here. Really? Are we sure about that? It seems there isn’t a good enough reason, without a cancer diagnosis, to extend ourselves or sacrifice that much, for others. Oh, but if people could just get a taste of it, of the kingdom here on earth, I think we’d live out the Lord’s prayer so much more intentionally. I don’t wish cancer on anyone. I DO wish everyone a glimpse into that kingdom, however. Someday, very soon. I have hope. Thank you, friend, for sharing with, and listening to, each of us! Not all of us want to wear pink ribbons and walk the Survivors’ Walk. Every person handles “the rest of her life” in her own way. Allow us to do that without judgment. For myself, I will openly speak with anyone about my breast cancer and treatment privately. I have a tremendous need to encourage others who are going through any form of cancer with my own story. But, please don’t push me to be public about any of it. If I want to, I will. And please do not judge me by whether i show up for all of the events. We are all in the same club, but how we are as members is uniquely our own. When I look in the mirror; never again will I see the same face staring back at me. Cancer, age and chronic illness stole my youth. It really shouldn’t matter. That is what I tell myself. I am the same person inside; but, the truth is people do respond differently. People don’t take the time to look deeper within one’s heart or soul. My eyes may be a little dimmer; but, God’s joy is still there. In fact, when all else of the counterfeit has faded; that is the thing that is stronger still. God is my JOY. He is my HOPE. He is my LOVE. God is my greatest treasure. I have learned the truth. I AM God’s Blessed and Beloved Child–Chosen and Redeemed, Heir of the Kingdom. For that reason, I can rejoice. I have come to know that all the trials that have been a part of this my journey were both for my good and the good of the Kingdom. Would I truly know the fullness of His Joy any other way? Or would I have taken joy for granted? Would I be able to reach out my hand or to keep writing with such passion had I not walked this road? Oh yes, the scars run deep; but, those scars have meaning, purpose that brought rivers of joy to me and I hope to all whom I meet. Michele, I thank God for your life. I used to listen regularly to your Podcasts with Michael Hyatt. 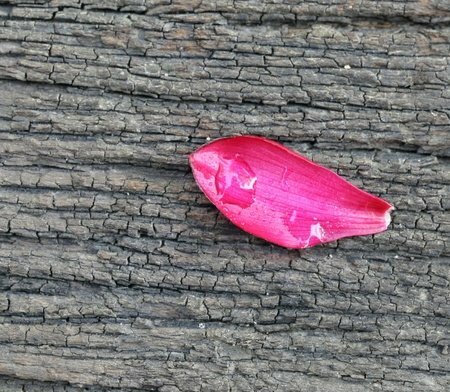 Recently, I came across your blog and that was a Divine connection, indeed, as I am a survivor too. I have been so encouraged by your writing and also by the many comments of your readers, especially, from those who have been through the same health challenge. Your honesty and transparency has been so amazing. You express so many times in words, what I have felt or am feeling. May God continue to refresh you as you refresh others. May He restore you to health and heal your wounds. Keep on pressing through, for His Glory. Thank you for being so honest and sharing your story one day at a time. I shared your post on my Facebook from my friend Heidi Hodges who also has cancer. We have known 3 others from our small church where we met who fought with cancer for many years or decades. I have known several other survivors who have been in remission (sometimes multiple times) as well as friends who lived their last days with cancer. My dad also has cancer now too. I am thankful for all the medical progress that God has used to allow those with cancer and their families to have just a bit more time with each other and a chance to receive His Son Jesus Christ for eternal salvation if they have not before their death. I know that physical death ends our pain and struggles here and can not imagine eternity with our indestructible souls living with something similar and worse when God never designed us to spend it in hell. I would not wish it on my worst enemy. I have found that having two immune system diseases myself (polycystic ovarian syndrome and Hashimoto’s thyroiditis) and my husband having two also (Crohn’s and ulcerative colitis) makes life rather unpredictable as if we had cancer. We have taken cancer drugs to decrease our immune system responses, as they are all at the severe stage. And making the most of our lives when we are well, as well as trudging along day to day when we are not, has been our new norm. Though we desire it, I have learned not to expect as much support as those with cancer because many are unaware that without medications, those with any immune system illness are also at the mercy of our bodies excepting God’s grace. I’m looking forward to the day when our new norm will be with other friends and family who are enjoying rest and peace in heaven while they live out their eternal purpose. Hope to see you there if not here. Your courage and honesty are an example for all of us to follow. It is amazing after all you’ve been through, that you still have courage in you to share your journey so openly. Thank you for the grace that you share with all of us. I am very thankful to God for every day that He gives life to me. He has been with me during every rough time in my life. He is constantly walking beside me, and He gives me hope for the future. It was wonderful to meet you this week in Colorado and learn from you. Thank you for your AMAZING presentation. I walked away stronger because of it. Thank you! Likewise, Ritika. Loved meeting you! Thanks for your honesty and courage Michelle, This Nov. marks 1 year since my cancer diagnosis. It took the wind from my sails for a bit, but the wind is back. I think you just perfectly penned exactly what my heart feels. I have a really hard time explaining this to others. My best friend died 4.5 years ago of breast cancer and I just finished up a 10 month long stint of my own breast cancer adventure. I cry a lot more now that I am done with treatment. I’m scared and I’m worried and I know that I shouldn’t be. It bothers some that I’m not just “getting on with life” but it’s hard to explain that my perspective, my desires, my hopes and my dreams are different now. I listened to you on Michael Hyatt’s podcast yesterday. Our cancer stories are very different and I am so very sorry for all the suffering you have walked through. I know that as you said yesterday that God will use it but I also know from my own path that being in the middle of it really sucked. I am really glad you are going to be on his show this season because I need a little help in figuring out how to get back on my feet again and take what I’ve learned and use it to draw others to Christ. “her funeral was Sunday.” It sounded as though Michele had gone on to be with Jesus. Yet, as I read on it appeared that the article was written by her, and she is very much alive. Am really, really confused. Is she still with us? Yes, I’m still here. 🙂 The post was about a friend of mine who recently died. She and I were in chemo at the same time. Thanks for your kindness and concern, Karen. Grateful. you are a wonderful woman. Have heard you in M Hyatt’s podcast and just now read this post. I am hooked! It is interesting how disease makes us all understand this life of ours is just a journey and that we are meant to live a never ending life after death! This was awesome!! I’m a cancer survivor- melanoma twice, breast cancer with a mastectomy. But I was fortunate with all three – they were caught at the earliest stage, so no chemo or radiation treatments. I also walked a good friend through her own battle of stage 4 cancer until her last day, so your words touched me on many levels. Your writing is SO important for everyone to read! Thank you, and God bless you and keep you well. I say YES to pray and help you get through each one. I take my praying seriously! …”send me Lord. Send me..! Just an encouraging note from one cancer survivor to another….“Christians, like snowflakes, are frail, but when they stick together, they can stop traffic.” Rick Warren from the Purpose Driven Life.